The Evolution First Aid Station from Safety First Aid is a comprehensive first aid solution for any workplace, combining a British Standard compliant first aid kit in a dust and moisture-proof Evolution case with dispensers for wound wipes, eye wash pods and plasters, all wall-mounted alongside crucial first aid guidance for emergencies. 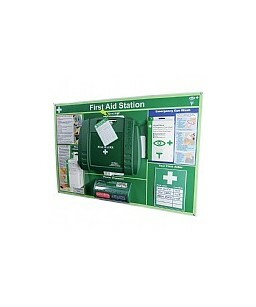 Ensure all your workers know where to turn following an injury with this eye-catching, well-stocked first aid station. 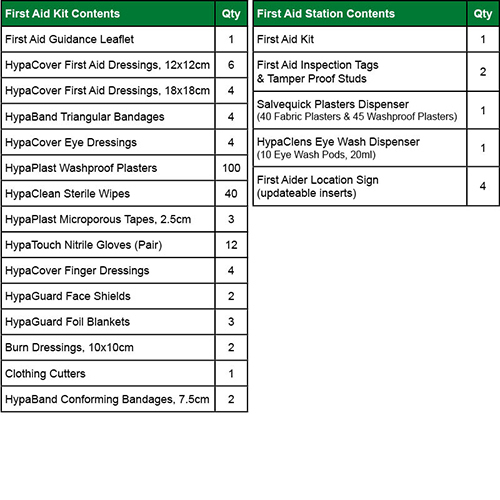 The First Aid Station includes a choice of a large or medium BS 8599-1 First Aid Kit in a rigid plastic Evolution first aid box. The case comes with a wall bracket featuring an innovative quick-release catch, enabling the first aid kit to be removed quickly and with one hand. The kit’s contents comply with the British Standard for workplace first aid kits and include wound dressings, plasters, bandages and more. The HSE’s ‘The Health and Safety (First-Aid) Regulations 1981: Guidance on Regulations’ states that “The contents of first-aid containers should be examined frequently and restocked soon after use.” To simplify this, 2 tamper-proof studs are supplied with the station which can be attached to the first aid kit’s handle. This discourages unnecessary opening of the first aid kit and means those responsible for first aid know when it has been opened at a glance, helping ensure compliance with health and safety guidelines. A first aid inspection tag is also provided so employees can note down the date of the inspection, who performed it, and whether the contents were all present and in-date. In addition to the first aid kit, the station includes three dispensers to allow minor injuries to be treated quickly without having to open the first aid box, keeping the main first aid kit for more serious incidents. Plasters are the most frequently needed item and also tend to go missing. The Salvequick pilfer-proof plaster dispenser discourages people from taking plasters for home use or when not needed as it’s only possible to remove one plaster at a time, and the plaster is ready for immediate use when dispensed. All you need to do is pull down on the plaster, enabling easy one-handed application. The dispenser is locked to prevent the plaster packet being removed by unauthorised persons. The sterile moist wipe sachet dispenser, with 50 individually wrapped wipes, enables you to clean your wound and the surrounding skin before applying a plaster or wound dressing. Also included is a dispenser containing 10 20ml sterile saline eye wash pods, for rinsing contaminants out of the eye. These can also be used to cleanse wounds. Each of the station’s components fit onto a clearly organised poster with designated areas for each one alongside essential step-by-step first aid guidance, giving instant access to lifesaving information with clear illustrations – including how to do the primary survey, CPR, and using emergency eyewash. 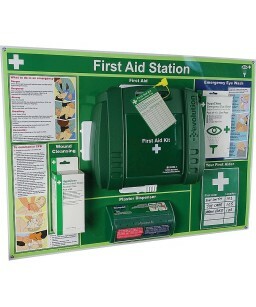 It also features a replaceable A5 first aider name and location sign mounted in a plastic frame. 4 inserts are provided so the first aider details can be replaced following staff changes. The station comes supplied with all the required wall fixings and instructions for mounting.